responses compare to other panelists completing the same sensory test. A new software tool for your Panelist Training. The screen identifies each attribute, sample and associated blinding code presented to the panelist in the sample presentation order. When a panelist's response falls outside the Standard Deviation of the entire panel, their response will be shown in RED. Print Screen of Panelist Feedback (as seen by Panelists). Print Screen of Panelist Feedback Report (as seen by Sensory Technicians). 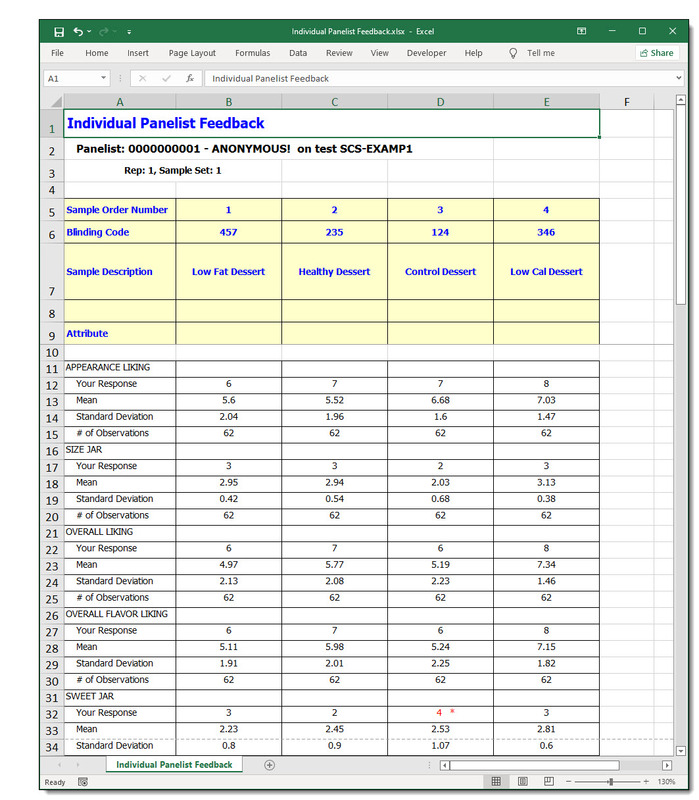 Print Screen of Panelist Feedback Report - In Microsoft EXCEL. 1. Print Screen of Panelist Feedback (as seen by Panelists). 2. Print Screen of Panelist Feedback Report (as seen by Sensory Technicians). 3. 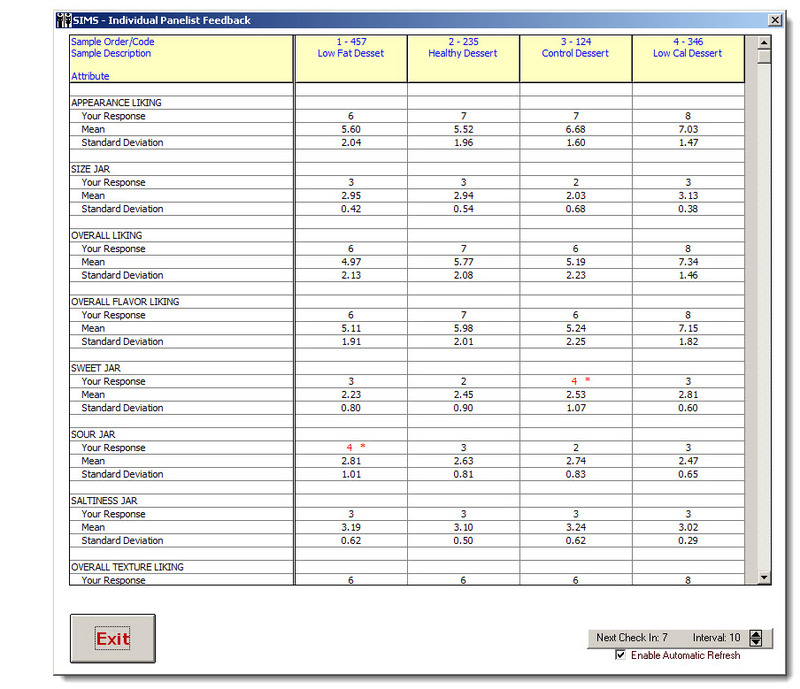 Print Screen of Panelist Feedback Report - In Microsoft EXCEL. 4. Print Screen of Panelist Feedback Report online SensoryTest.com (as seen by Panelists). Response      Panelist numeric response, the current panelist only. Observations  This row optionally can be hidden from the report. If a sensory test design has samples in more than one replication, additional on screen options will be available. - Please Select a Rep Number. Select your desired rep, or select 'Average' to have all reps combined and averaged. which they are presented to the individual panelist. Multi Rep Tests, Panelist only see their current active Replication. absolute sample numbers, not the presentation order which usally varies accross reps. The attributes are always shown in order of presentation from top to bottom. two times the Standard Deviation, the response will be followed by two asterisks. 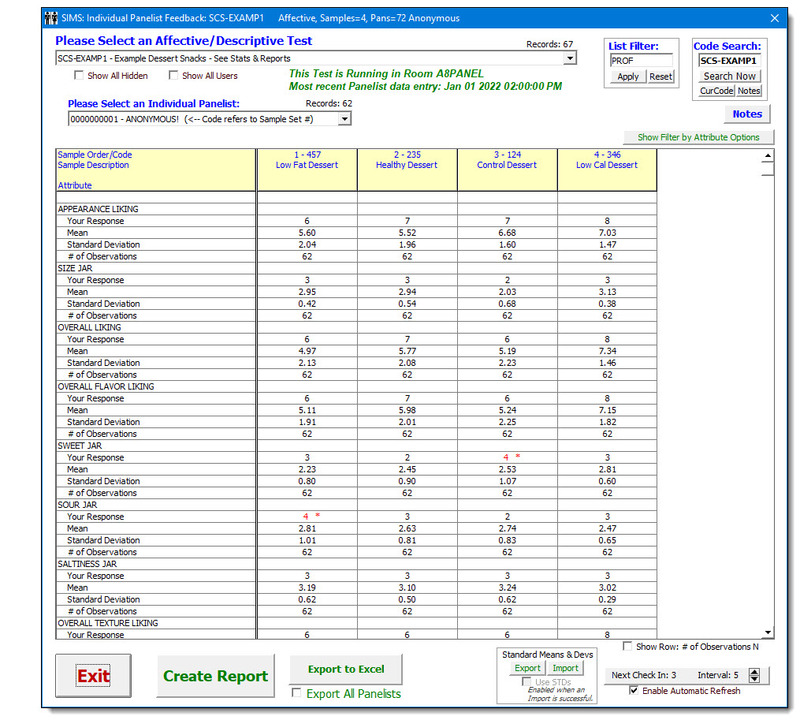 The report should provide enough room to display 3 or 4 sample columns easily. mouse to drag the column dividers left or right. right, the attribute information always appears in the leftmost column. shown in the lower right hand corner of the report form. viewing observations even when panelists Take Test at This Station. click the words 'Next Check in' when the 'Enable Automatic Refresh' box is marked. can also refresh the report by clicking the 'Create Report' button. 1. Select a Test Result. 2. Select an individual panelist among those who have responded to one or more test attributes. 3. If test data exists for more than one Replication, you will see a combo box to select a single rep.
to create an Excel spreadsheet file to share with others or to print for the panelist. standard deviation for attributes and samples to which ANY panelist has  responded. Allows technician to SWAP in external values for Standard Means and Standard Deviations. in which case the means and deviations will be the true calculated values from the live test participants. Excel:  Use Excel Export and Import to create your Attribute standards. Import via Windows Copy-n-Paste of the spreadsheet's significient cell block, usually the white background cells. Recommendation:  SAVE your Excel files containing Attribute Standards for future use. The Excel file's attributes are matched to the test's attributes by the actual text wording in Excel Col A. If no attribute match is found, the attribute mean and dev will remain the true calculated values from the live test. and are matched to the test's absolute samples. 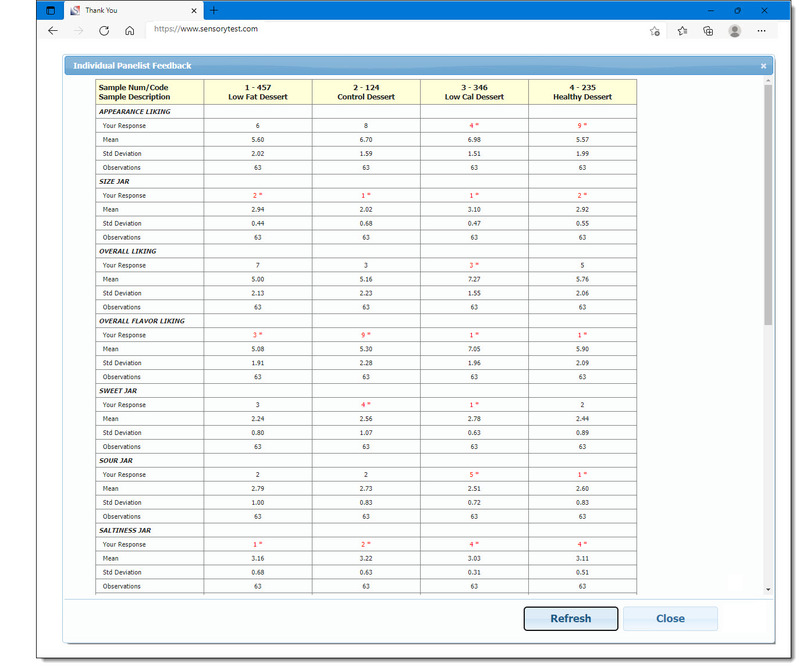 WHILE THE SAMPLE ORDER THAT IS SHOWN on the SIMS Report may be a different order for each panelist, this order may not be the same absolute sample orders in your Excel. Its totally ok, just be aware when you [import] multiple sample columns from Excel, eventhough it may not be the same order left to right, the data is indeed landing prnoperly. and the attribute mean and dev will remain the true calculated values from the live test. Recommendation:  Verify your reports for accuracy and successful use of your Standard Means And Standard Deviations. and perhaps with each other. Panelist Feedback will NEVER be displayed when Test Result data is NOT saved. even if the panelist has not completed all samples in the test. clicks the 'Previous Page' button.